Beddit 3 Review - Should You Still Consider Beddit After Apple's Recent Move? Is Beddit more than just a "good enough" sleep monitor? In this review, we go over several questions about this sleep tracking device that you might have in mind. Along with that, we will be talking a little bit about the history of Beddit since this could be a critical factor for your final decision on whether to give it a chance or not. Improving sleep quality using a sleep tracker is becoming a popular trend lately, and big brands like Fitbit have been adding sleep tracking support to their product range, Charge 2 HR, Blaze, Alta HR and Ionic, just to name a few. Apple has released a new version of the Beddit Sleep Monitor since it acquired the Finnish company in 2017. The new model looks very identical and does not seem to provide any new features. It requires at least an iPhone 5s that runs iOS 12 or later. You can buy Beddit 3.5 from an Apple Store or Apple's website, and it still costs the same $150. How Accurate is the Beddit Sleep Monitor? Some people argue about whether you need to track your sleep patterns in the first place? The Beddit was born from such a need as a $500,000 Indiegogo campaign back in 2013. Lasse Leppäkorpi, who was the guy behind the Beddit, was an elite triathlete and had an overtraining syndrome at the Sydney Olympics in 2000. One part of Lasse's recovery process was to track his health metrics using a wearable tracker 24 hours a day. He soon noticed that a wearable sleep monitor had its drawbacks and the idea for a non-wearable sleep tracker that doesn't affect the quality of the sleep during the night was on the way. The Finnish company, Beddit, started to sell its non-wearable sleep devices in Apple stores in late 2015. Not before long, Apple acquired Beddit in 2017. Beddit could be a forerunner for the sleep technology that Apple Watch serious may offer in future. However, there were no official statements made about what Apple was planning with Beddit. Interestingly, last year in 2017, the Beddit was out of stock in the Apple store which led to rumours that Apple put the Beddit to rest. Beddit also partnered with Misfit in 2014, a company that specialises in wearable technology, fitness trackers and smartwatches. A co-branded version, Misfit Beddit Sleep System, was on the market for a while but it is not for sale neither on Misfit store nor any big stores like Amazon anymore. You may find it on eBay but keep in mind that this version doesn't have the smart features of Beddit 3. 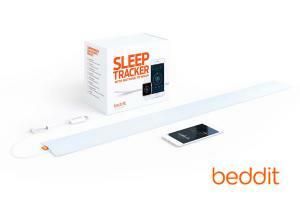 Beddit 3 sleep device has a contact-less sleep sensor that you can embed under your bed sheet. The main advantage of non-wearable sleep trackers is that you don't have to change any of your sleeping habits. After you finish the setup process, you tick on a start button on your smartphone, and that is all there is to it. The sleep tracking system is ready to do its job without making any modifications in your bedroom environment or adding any additional gadgets on your body. I recommend you prefer this type of non-wearable sleep devices especially if you don't feel comfortable wearing something on your wrist all night long. Besides that, the probability of using a contact-less device in the long term would be higher than wearable ones for most people as it usage is more straightforward and less obstructive. Beddit comes with an 80cm(2.5ft) long strip of fabric that you place under the sheet on top of the mattress. It is very thin, soft and flexible and you won't feel anything as it is not noticeable at all. The previous version, Beddit 2, used an adhesive strip to attach the sensor unit to the mattress pad. But the stickiness of the strip was lost with time as you change or adjust its position from time to time. This was a major issue, since getting accurate data depends on placing the sensors at the right position on strip based trackers. With Beddit 3, one side of the strip is made of rubber which helps in keeping the sensor strip in place. But if you experience that it still doesn't stay on the mattress, as a last resort, you may sew the strip to the bed using a thread. 80 cm of strip length is usually good enough for most people but If you sleep alone on a large bed, move a lot in your sleep, bear in mind that the sensors can not track your body signals if your body is not ON the strip itself. Beddit connects to a smart-phone or an Apple watch app wirelessly and transfers the sleep-related data it collects from the sensor while you are in bed. It can also deliver the data to Apple Health App. One problem here, at least for some people, is that you have to place the iPhone next or close to your bed. If you are one of those attached to cell-phone type of person and don't care to keep your smartphone close to your body all the time, that might not be an issue. But if you don't like the idea of keeping a mobile phone close to your body due to any potentially harmful effects on your health, you may look for other alternative sleep trackers like Nokia (Withings) Sleep. Beddit uses force sensors (placed under the bed sheet) to measure the factors that affect the quality of the sleep. It uses a method called ballistocardiography (BCG) to measure HRV(Heart Rate Variability), respiratory activity and body movements. Taking into account all these factors, Beddit can differentiate between different sleep cycles. In 2013, a clinical study was conducted to compare the heart rate data with results from an electrocardiogram (ECG), and polysomnography (PSG). 44 people with a 20 to 74 years old age range have participated in this study, and 99.94% of precision was achieved. You can look over about this read the full text here. Beddit 3 has a new feature called "Automatic Tracking." When you enable auto tracking using your Beddit app, you don't have to push any buttons on your phone to start the sleep tracking process. The Beddit sensors catch the signals of whether you are lying in bed or you are out of bed. Although automatic tracking adds another level of comfort to sleep monitor usage, keep in mind that the Beddit sensors begin to monitor your sleep as soon as you are in bed. If you play your favourite game or read a book in bed before you go to sleep, the statistics like "time to fall asleep" or "awake in bed" will not be that correct. That is probably why other similar trackers like Nokia Sleep or SleepScore Max don't include this feature and also why the manual mode is the recommended mode in Beddit's user manual for a more accurate sleep tracking data. If you enabled the automatic tracking option, Beddit is ready to take care of the rest. Another option is to start it manually or preset a time to turn on the tracking. Once you are in bed, and activated the Beddit device, force sensors in the strap start recording your heart rate, breathing, snoring and environmental factors such as room temperature and humidity. If you wake up, toss and turn, snore or rise from the bed, the Beddit records all these events to measure the overall quantity and quality of your night sleep. Then the next morning, Beddit app prepares a report of your night's sleep including all the details below, on whatever device, iPhone, iPad or Apple Watch, you connected the Beddit with. How long it took to fall asleep? How long you were awake and away from bed? Beddit app provides you with an overall sleep score taking into account all the factors mentioned above. A score of 75 or higher is an indicator that you had a good night's sleep. Beneath the sleep score value, the app provides a quick overview of sleep time, sleep efficiency, heart rate, and respiration rate along with a comparison of the last night's scores with your averages. Although Beddit gives you some sleep tips on how to improve your sleep quality, you need to play a more active role than only to rely on suggestions if you want to increase your sleep score. Tracking your lifestyle and daily habits, and making small adjustments to see how those changes affect your sleep score could be the real game changer for improving your sleep quality. You can use the Notes features in the app to see how your sleep quality is affected by your feelings, habits or daily activities or even environmental factors. Do you wake up feeling groggy and tired all day from time to time? The sleep cycle that you are in at the moment of waking up may affect how well and refreshed you start the day. Beddit has a practical and helpful feature to wake you up, probably on a lighter sleep phase period. You might have to leave your bed a little earlier before the pre-set alarm time is reached, but most likely, you will be rewarded with starting your day more refreshed and energized. 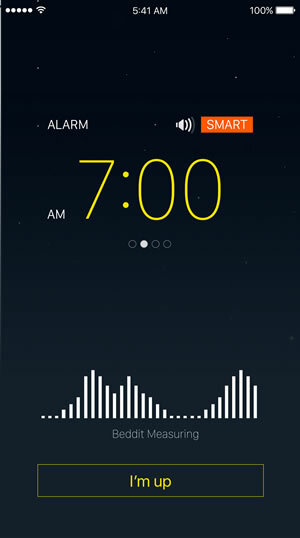 Smart Alarm is not a new feature for sleep trackers. 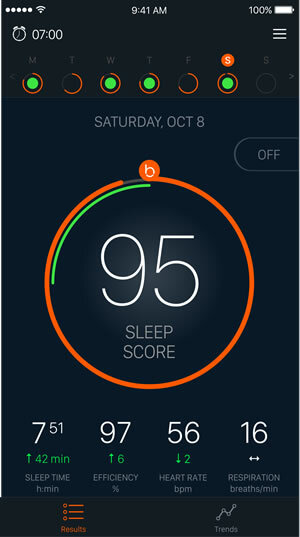 The success of this feature depends on the accuracy of the collected sleep data, and Beddit seems to do a good job here. People reviewing the Beddit emphasize that this alone could be worth to buy the product. What about sharing a bed with a partner? You can use Beddit without any issues as long as you are on the sensors during the night. It is also possible to have 2 Beddit devices on one bed. Two strips and two phones, each device track each partner separately. Can I use Beddit on Android platform? Beddit app is not available on the Android play store anymore, and there are many complaints about the Android app not being reliable from users who have installed a previous Beddit app version. Also, the features like Notes and Trends only work on IOS version. Where can I get support for Beddit product and app? As Beddit is part of Apple, all support requests are handled by Apple support center. Beddit cost about $150 and still on sale at the Apple store, but it is not available on Amazon anymore. It is not cheap but when compared with other non-wearables products, not that expensive either. If you are looking for a more affordable strip based alternative, you can check out Nokia Sleep which comes with a $99 price tag. Beddit is an easy to use sleep monitor with some science behind it. After puzzling out some technical usage issues, like sleeping in the right position on the strip or placing strip correctly under the mattress, you are ready to track and improve your sleep quality. Beddit measures resting heart rate, breathing frequency and movement signals and provides you with the result in a simple UI with an overall sleep score, that takes various factors into account when calculating sleep quality. Smart Alarm helps you wake up on a light sleep period, and I believe Beddit does a good job here. The sleep data provided by Beddit is good enough for a novice user, but if you are a data junkie or want to know more about how sleep score is calculated or wish to have full access to the raw data, you may not feel fully satisfied. We don't know what Apple is planning the future of the Beddit. It is likely that Apple is trying to integrate the sleep tracking technology into their new generation Apple Watches, which might be a sign of why they acquired the Beddit at the first place. But there is not much evidence that Apple will continue to support Beddit as its primary sleep tracking product and the recent announcement about cloud service shut down is in-line with our doubt about Beddit's unknown future. Warning For Android Users - It may not work with your current Android phone. There is not much support for the Android Platform. SleepTuner Review - Does Different Mean Better? Go2Sleep Review: The Ultimate Sleep Solution? Is the SleepRate App the Sleep Tracker for You? Dreem Review: Accurate and Effective, But Do You Have to Sacrifice Anything for It? The Eight Sleep Tracker Review: Packed with features, but Is It Worth it?